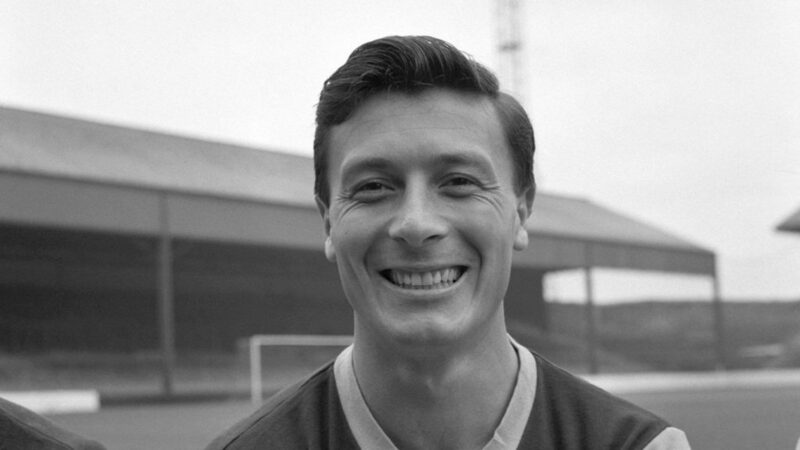 Burnley Football Club is greatly saddened to hear of the death of Jimmy McIlroy – widely regarded as the Clarets’ finest ever player and president of the club. McIlroy, who has died at the age of 86, made 497 appearances for the Clarets in a golden age for the club. The Northern Irishman, who spent 13 years at Turf Moor, was an integral part of Burnley’s 1960-Championship winning team under legendary manager Harry Potts. An inside-forward who wore the number eight and number 10 shirt in a period of outstanding service to the club, McIlroy scored 131 goals as the Clarets became one of the best teams in the country. After signing from Glentoran in March, 1950, Lambeg-born McIlroy, made his Burnley debut under the management of Frank Hill in October, 1950 in a First Division game at Sunderland. A wonderfully skilful and creative player, McIlroy went on to become a mainstay of the side that didn’t finish outside the top seven in the First Division between 1956 and 1963 – the year he left the club to join Stoke City in a move that devasted the club’s supporters. Potts took over as manager in 1958 and with the inspirational McIlroy heading a team of talents, including club legends Adam Blacklaw, John Angus, Alex Elder, Tommy Cummings, Brian Miller, Jimmy Adamson, John Connelly, Ray Pointer, Jimmy Robson and Brian Pilkington, Burnley were crowned league champions for only the second time in their history in 1960. That earned Burnley a place in Europe, McIlroy starring as the Clarets reached the quarter-finals on the European Cup the following season. McIlroy was also one of Northern Ireland’s finest players, winning 55 caps and helping his country reach the quarter-finals of the 1958 World Cup in Sweden. After ending his playing career with Oldham Athletic, McIlroy briefly managed the Latics and Bolton Wanderers. But his home remained Burnley, where he lived for the rest of his life. McIlroy, who has a stand named after him at Turf Moor, was given the freedom of the Borough of Burnley in 2008 and made an MBE in the New Year’s Honours of 2011 for his services to football and charity. He was inducted into the Northern Ireland Football Writers’ Association Hall of Fame in 2012 and the Hall of Fame at England’s National Football Museum in 2014. The Clarets have lost a true club great and a part of their history, and the club’s thoughts are with his family and friends on this sad day. I am not old enough to have seen Jimmy play but I have yet to speak to anyone who saw him say he was the greatest. I had the pleasure of meeting Jimmy in the mud 90s when I worked at The Turf and he was a guest of the club. You could see the esteem in which he was held by those who saw him play. I managed to chat with him for a few minutes and he was such a modest bloke. A real gentleman happy to chat and pose for photos with those who asked. And there were many. We will never see the like of Jimmy again, that era has sadly gone. As the greatest of our Championship winning side of 1960 leaves us, I can only say RIP Jimmy McIlroy MBE. R.I.P. Jimmy. Hopefully Burnley will secure their place in the Europa, which would be a fitting tribute to your legacy. A true legend of Burnley Football Club and the town. A true gent who would spare anyone a minute of his time. greatest players ever to grace these shores. and thrilling us Burnley fans in the process. Thanks for everything Jimmy .Rest in Peace. Jimmy left the full back on his arse and scored a penalty in that game! it was a beautiful summer evening my mum went on the Turf for the one and only time! My sincere condolences to your family and friends. Greatly saddened to hear of the death of Jimmy Mac. I was a young girl when I first saw him play in the heady days of the late 50’s and early 60’s. Condolences to all his family, his friends and the extended Claret family wherever they are in the world. I had the pleasure off sitting with Jimmy in his later years in lounge at a discrete venue in Colne along with my wife as Jimmy sat with my mum and chatted about his life,coming over to Burnley the adventures he had as a young lad and his pleasure of playing for Burnley F.C. Jimmy was the smartest guy, very proud and it was an absolute honour to sit laugh chat and sometimes cry with a very special person. We felt very lucky to be in Jimmys company and will never forget him as a person and player of this fine club. I never saw Jimmy play, but I had the privilege to meet him whilst in the corporate area. A Legend and true gentleman. Had the pleasure to watch Jimmy play many times and had the pleasure of meeting him on a few occasions . Clarets legend and a true gentleman. Growing up as a young Burnley fan it was a pleasure and a privilege to witness the skills of Jimmy McIlroy; he was, nevertheless, a team player who shone in the magnificent side that gained the First Division title. I’m so thankful he was eventually able to reconcile with the club; a wonderful gentleman, Burnley’s finest! a few years ago I went to the great mans house, with his autobiography tucked under my arm, to ask if he would sign the book for me, he not only signed the book, he asked me into his home, and even made me a cup of tea, we talked about football for about half an hour, before he signed my book. I was a total stranger to him, but he invited me into his home, if he had signed the book on the doorstep I would still have been thrilled to bits, but it just shows the gentleman that he was. R.I.P. Jimmy, a true clarets Legend. The term ‘Legend’ and ‘Hero’ is lost in today’s society of reality wannabees. You were a ‘Legend’ and ‘Hero’ to many a supporter of our proud and famous football club. You helped to bring glory but never let it go to your head, your humility was a precious commodity and later in life, to choose to receive your MBE at Turf Moor said it all. You leave a void that will never be filled. RIP Jimmy, you were what most people want to be, humble, gentle & brilliant at your game. rest in peace now as you deserve it. GOD BLESS! I just remember seeing you play, Jimmy and what a privilege that was (even though I did not know it at the time). What a team we had then and even today’s boys would struggle against you, great that they are. Thanks Jimmy Mac for making an 8 year old boy’s dreams come true in 1960. You were the David Silva of your time. A magician. But you didn’t have the big wages, plastic ball, “slip on” boots and perfect pitches. Rest in Peace. God Bless. Condolences to your family. What a legend, never be forgotten. I grew up in burnley and as a 15 year old with my rattle went to see jimmy mac play. What a star and a true gentleman. They were good days and it was a pleasure to see jimmy play also i and many saw him shopping in and around burnley always smiled if you said his name out loud. Rest in peace. Liz hartley. Rawtenstall. A real gentleman,and a brilliant player. Rest in peace. I was so sorry to hear of Jimmy’s passing. My heartfelt condolences to his family and friends whom I hope can all take great comfort from the fact that Jimmy was a hero to so many, and will forever be a part of Burnley Football Club. Rest in peace Jimmy McIlroy MBE.